Dubai, UAE, December 29, 2016: Starting the New Year, women find themselves making changes to their hair care regimen in an effort to refresh their hairstyle and reinvent their look. For women across the region, Head & Shoulders Smooth and Silky shampoo is the perfect new product to change up their routine – and it has even impressed some of the region’s most notable TV stars. 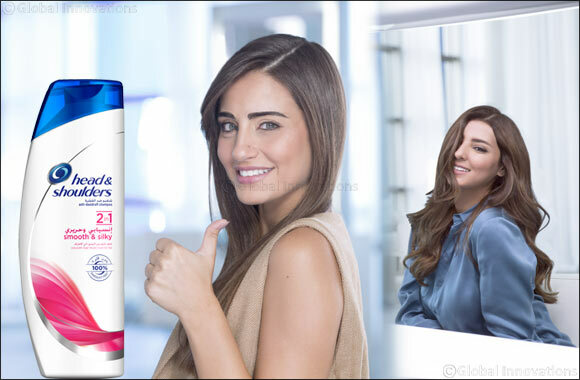 When TV host and producer Mariam Said, actress and model Amina Khalil, TV host and actress Aimee Sayah, and actress Safae Hbirkou were asked to try Head & Shoulders Smooth and Silky shampoo, they were left speechless thanks to its cleansing, moisturizing, and restoring properties. Head & Shoulders Smooth and Silky shampoo is a game-changing complete care shampoo that leaves hair soft, smooth, and silky. It is designed to cleanse, moisturize, and protect hair to keep your locks noticeably stronger, healthier, and more manageable! Its gentle cleansing agents with smaller zinc particles create a rich lather that is deeply indulgent, with 6 moisturizing ingredients to restore your hair’s unique texture and feel. And its protective formula coats hair strands from root to tip to lock in moisture, ensuring that your locks are smoother and more beautiful than ever. Delivering the best products for superior scalp and hair health is always at the forefront of hair care innovation at Head & Shoulders. Created to moisturize and restore hair of any length, type, or texture, Head & Shoulders Smooth and Silky shampoo is the product that’s been missing from your hair care routine. In 2017, say goodbye to your old hair care routine and achieve the healthy, hydrated locks you’ve always wanted with Head & Shoulders Smooth and Silky shampoo.